Please join us for the Follow The Sun book signing August 5. 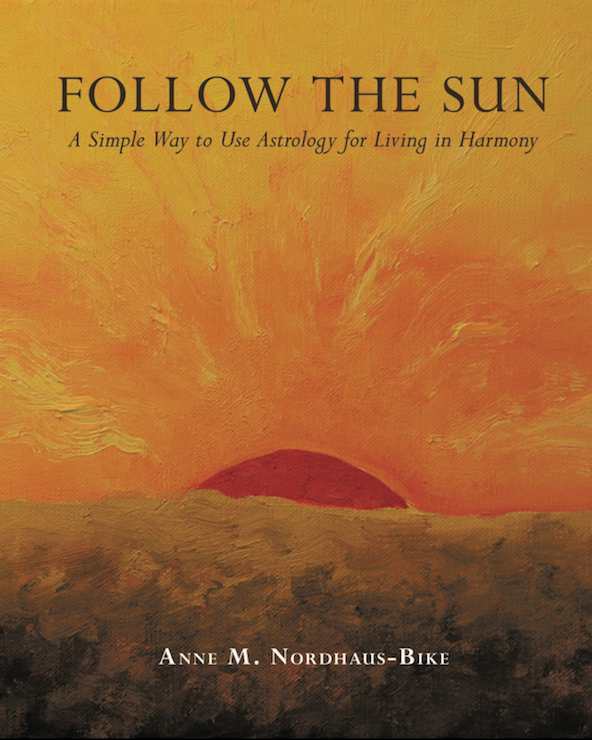 Please join us for the Follow The Sun book signing Sunday, Aug. 5, when award-winning astrology author Anne Nordhaus-Bike will speak about her Follow the Sun book and sign copies afterward. The event will be held at DeLux Bar and Grill, 669 N. Milwaukee Ave. in Chicago’s River West community. Hear Anne and fellow writer Jennie Spallone, author of the crime/suspense novels Deadly Choices and Window of Guilt, talk about their books. Get your copies of both writers’ books, meet Anne and Jennie, and get your books signed. The event will run from 2 to 4 p.m. Nordhaus-Bike and Spallone will speak at 3 p.m., with book signing immediately afterward. Admission is free; cash bar. Books will be available for purchase. All three books have a Chicago orientation. Nordhaus-Bike’s Follow the Sun looks at the attributes of the signs of the zodiac as exhibited by famous Chicagoans. Spallone’s Deadly Choices is set in Chicago, and Window of Guilt’s main character is from Chicago. Follow the Sun offers a timeless, annual guide to using astrology for living in harmony with yourself, others, and nature. Follow the Sun reviews each astrological sign, shares ideas for making the most of that sign’s energies and opportunities, and shows how a public figure born under that Sun sign expressed its energies. This full color book is enhanced with numerous images, including reproductions of all 12 original watercolors the author—a professional artist who has exhibited her work widely—created to symbolize the signs of the zodiac. Every chapter of Follow the Sun also offers suggestions for balancing your life. If you’re driving, you may find parking on Milwaukee Ave. or one of the side streets nearby, but if not, go south of the bridge at Erie and Milwaukee and there is pay and display parking on Milwaukee, on Grand, and on Halsted. Some of the side streets near the gallery have zone parking, but the zone doesn’t go into effect until 3 p.m. To take public transportation, get off at the subway station at Grand, Milwaukee, and Halsted. All 12 zodiac paintings from Follow The Sun – plus the Glorious Sunrise cover image – are available as beautiful, premium gifts. All our designer gifts are inspired by astrology. That makes it easy for you to enjoy living harmony: not only are these gifts beautiful, they’re practical and powerful because they help you be your best self. And you can make these gifts your own, because all our gifts can be customized!